For those of you who like to know about local planning applications, I thought I’d do a roundup of what’s happened to some of those I’ve highlighted here in recent months. It includes an important petition which you might like to see. There’s considerable opposition to this speculative demolition of two beautiful local homes – much loved by the people who previously lived in them – in order for a builder’s greedy attempt to shoehorn in no fewer than six three-storey houses. You can see the details here. Neighbours have been amassing objections to the proposals, and have now launched a petition, which can be seen here. If you’re at all supportive of their objections, please take 20 seconds to sign it now. If you really want to contribute, my article above tells you who to email with your comments. This proposed ‘garden grab’ house (see article here) rumbles on, with many neighbour objections. As with most of these bottom-of-the-garden developments, a driveway has to be made all the way to the road, and amongst the consultee comments I see one from Cambridgeshire Fire and Rescue saying that access for them would be inadequate. That may prove a sticking point for this one. Still no decision on this one, a reincarnation of proposals that have been rejected three times by the Council’s Planning Committee but since overturned by a Planning Inspector. The developers are expecting a decision from the Council on 1 February. Still no decision on this one either. Several objections from local residents concerned about the significant likely increase in traffic movements. New drawings have been submitted for this one (above) and the consultation date appears to have been extended to 17 January. Permission was granted for this one. Revised plans were put forward for this one in November, and further objections were received from neighbours. Decision is still awaited. 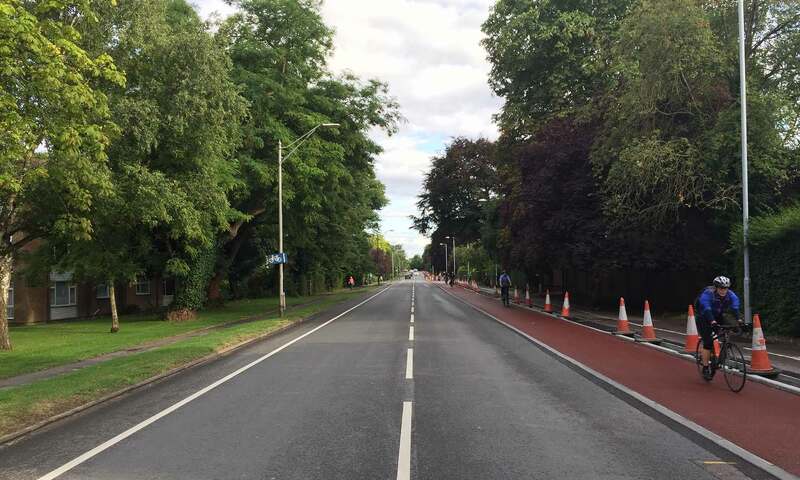 I last wrote about this a year ago, and in the meantime, the Council has been brewing up plans for the extension of the Hills Road cycleway down to Addenbrooke’s. The plans are about to be revealed, and there will be public displays on Addenbrooke’s Concourse next Tuesday lunchtime and at St John The Evangelist on 26 January. Do try to attend and let the planners have your feedback on this important project. Please take a moment to visit the 3-5 Queen Edith’s Way petition here. If developers can be allowed to maximise the profits they can get from demolishing perfectly good houses, it could be the one next door to you next. This is yet another example of our Council bent on disfiguring, even destroying, neighbourhoods by crowding buildings together. The Queen Edith’s Way surroundings are among the loveliest remaining environments. The Plan under consideration isn’t defendable. This is a very useful ( and needed! ) service, Chris. Many thanks for putting everything all in one place like this. Pity ( and indeed, shame) that our local ‘representatives’ appear to care so little. Chris, thanks for including the petition link in your update – very much appreciated. Please could I encourage everyone to read and sign the petition. This is an opportunity for the community to have a common voice against developers who continue to profiteer through the destruction of decent family homes in Queen Edith’s. Cambridge needs more family homes because thousands of new jobs continue to be created in the City. Either Cambridge gets bigger (and you build on more of the green belt), or land values remain astronomical and every scrap of land comes under this kind of pressure. You can’t have it both ways! Pointless to blame greedy develops when all you are seeing is the natural consequence of a distorted market. The petition against the proposed development of 3 and 5 Queen Edith’s Way was delivered to Cambridge City Council earlier today with 108 signatures. Clearly, the community does not welcome the development in its current form. I hope our councillors are listening……. The petition will remain active if anyone further wishes to sign or comment. Many thanks for your support. Chris, as website/newletter editor, don’t you think you should be a little less partisan when announcing these planning applications? Your bias is sticking out like a Mandrill’s arse! Obviously people have opinions on building more houses in Gardens and densification by converting large plots into flats or smaller houses, but framing matters and I think you should just tell us what’s going on so we can make up our own minds. I’m happy about densification on the whole, and especially about the replacement of shockingly inefficient old houses with new passivehouse-grade ones. We only have 20-30 years to fix every building in the UK to a decent standard if we want any chance of keeping global warming under 2C. So there’s no harm doing the bits which pay for themselves already. Sadly there is not yet a requirement for all houses to be passivehouses in Cambridge (Exeter, Brussels and Dublin have it), but even 2009 building regs, whilst feeble, are a huge improvement on the buildings that are there, unless they’ve had truly epic levels of refurb done. Wookey, this is my personal blog and clearly labelled as such. I often feel I could be even more partisan, but try to rein myself in. If you want a non-partisan blog, write one yourself, or vote for a council which will provide you with the information more clearly than they do in a non-partisan way, perhaps making my blog redundant. Wookey, just seen your comment. Chris and I both try really hard to differentiate between posting/tweeting as individuals and as QECF, and are very conscious of the risk of confusion. The QECF’s role in the debate is to disseminate information and help residents understand who to speak to and how processes work so they can communicate their own points of view. If you watch back the video of the public meeting on development last July which we invited Lewis to speak at, or the City Council hustings last April, we are scrupulously neutral, and – all other things being equal – will continue to be so. However, as private individuals, we do have opinions and are free to express them as long as it’s clear ‘who’ is speaking. This is Chris’s blog, as indicated by the strapline above, the absence of QECF branding and the voice he uses. Similarly, when I tweet, I tweet as me, not QECF. Sadly, it’s in the nature of volunteering that it’s often the people who feel most strongly about things who step up and that can cause a perceived overlap, but I don’t think the QECF, or Chris, or I can be accused of that. OK. Fair enough. I had not appreciated that queen-ediths.co.uk is not the QE community forum as it’s the same people, it says ‘Queen Edith’s Community News’ over there in the sidebar, the domain name is suggestive, I am subscribed here and get email from telling me what’s going on, and it seems to be where things get discussed. You can see how confusion arises. But it does also say ‘personal views on local issues’, so point taken. I have now found queen-ediths.info, but ironically (it being the ‘Community Forum’) that doesn’t have a forum, although it does have a mailing list, which I do get mail from. I had entirely failed to grok that there were two separate lists with different editorial policies. I do appreciate your efforts to inform, so I’m not just moaning – I was genuinely confused about the personal/community split, and this blog _is_ effectively the community discussion board, like it or not. I don’t think that a 3rd QE blog/site with different biases would really improve matters. Do you? Next PostNext Cycle Lanes To Addenbrookes: Who’s In Charge Here?